In Pakistan, young musicians are using music to vocalize their thoughts on the charade that is Pakistani politics. Two bands in particular, Topi Drama and Beygairat Brigade, have recently released songs that touch on the current state of affairs in the country. Topi Drama members Sohail Qureshi, Arafat Mazhar and Kenny Zeerick have released “Khoon” (translated as “Blood”), a song that confronts the recent spate of terrorist attacks and target killing incidents against Pakistan’s persecuted Shia community. 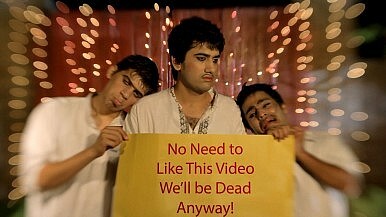 Then there are the princes of social satire in the local music scene, Beygairat Brigade, comprising members Ali Aftab Saeed, Daniyal Malik and Hamza Malik. After releasing their first single, “Aalu Anday” (translated as “Potato and Eggs”) in 2011, poking fun at the government, the band went on to release “Sab Paisey Ki Game Hai” (translated as “It’s all a Money Game”) and “Dhinak Dhinak” this year. “Dhinak Dhinak” has created quite a stir. While the song is a catchy, fun little ditty on the one hand, the lyrics disparage the country’s military establishment on the other. Interestingly, the tune was released just two days after the arrest of the former president of Pakistan, Pervez Musharraf. From Saeed’s perspective, Pakistan’s youth are already proactive. “We are trying to give them an alternate opinion which they will hardly come across while listening to their regular, single-tracked television shows and reading agenda-based newspaper articles in their daily routine,” he said. While Topi Drama and Beygairat Brigade are making waves today, social commentary in music churned out by local bands isn’t an entirely new development. In the past, songs such as “Yeh Hum Naheen,” a collaborative effort by well-known Pakistani artists against terrorism, “No More” by Junoon, “Mein Tou Dekhoonga” by Strings, “Alvida” by Salman Ahmad, “Laga Reh” by Shehzad Roy, “Umeed-e-Sahar” by Laal, “Bum Phatta” by Ali Azmat, and many others have stirred the local music scene, prodding listeners to become more socially conscious of national issues and events. It is heartening to witness new Pakistani bands raise their voice in this way. Social satire in music may not bring about revolutionary change in Pakistan, but this new breed of socially conscious musicians is teaching young Pakistanis to think about the system and question the establishment. In so doing, these bands are nudging youth to form opinions of their own and be more proactive on pressing issues that need their urgent attention.